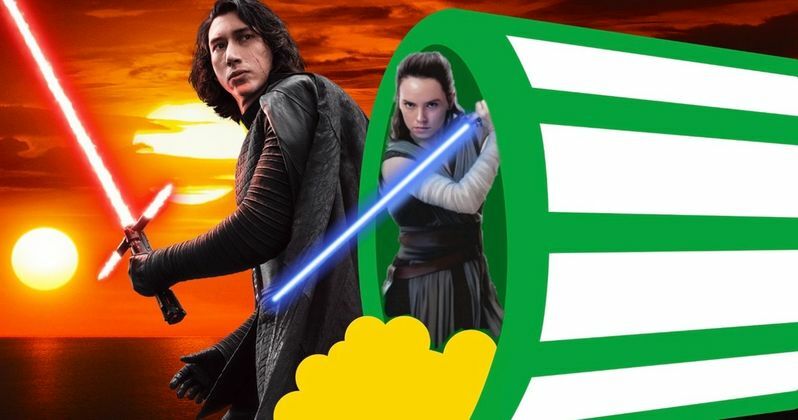 Star Wars 9 has been under attack since The Last Jedi hit theaters, twisting a whole faction of angry fans into an absolute frenzy. Those haters are now turning it up a notch, as they begin review bombing J.J. Abrams' sequel on Rotten Tomatoes a full 10 months before it hits theaters. We haven't even seen a trailer yet, and no title has been announced. This is a growing trend that is spiraling out of control. These same trolls went after Captain Marvel, tearing into the latest MCU adventure weeks before anyone had a chance to see it. Their madness has worked, in that the 'Want to See' rating on Rotten Tomatoes has since plummeted to a devastating 27% for Carol Danvers' first outing. There is no Tomatometer review rating yet, as Captain Marvel is under critic embargo until Tuesday, March 5. It appears that the plan is to get Star Wars 9 all the way down to a 0% 'Want to See' rating before Audience reviews are allowed on the site, which is possible. The 'Want to See' rating for Captain Marvel was in the 80% range before it got bombarded with negative comments. Similar tactics were used against Black Panther last year, but that went on to be a true box office phenomenon and earned over $1 billion worldwide. We don't yet know if this type of 'review bombing' will hurt Captain Marvel financially. Things have been particularly heated amongst the Star Wars crowd ever since The Last Jedi arrived in theaters over a year ago. The second chapter in The Force Awakens trilogy was quite divisive. The sequel has a 91% Fresh Rating on Rotten Tomatoes but its Audience Score goes in the opposite direction, coming up rotten with just 44%. Many believe that the Audience Score is so low because these same trolls waged a campaign to take those numbers down with hate-filled reviews about how Rian Johnson ruined the entire Disney-owned franchise. This disdain for The Last Jedi even spurred a movement called The Fandom Menace, with whole Youtube channels devoted to putting Lucasfilm and Disney in their place. These 'rebels' go at it like they are trying to take down the Death Star. Both Rian Johnson and Lucasfilm boss Kathleen Kennedy are equally blamed for 'ruining' Star Wars, though there's still a lot of fans who actually like The Last Jedi. They mostly go unheard because the roar coming from the Fandom Menace is a loud one. Colin Trevorrow was supposed to helm Star Wars 9, but he was fired from the project, and The Force Awakens director J.J. Abrams was brought in to finish what he started. And it's long been rumored that he is course correcting the ship to satisfy all fans. Many believe that Star Wars fandom has taken a toxic turn. And there may be no going back. Those spouting the most negativity act as one would if they found a turd in their Taco, though. And can't necessarily be blamed for wanting to rally against these big bites of bad tasting food now being served at what used to be their favorite fast food restaurant. If you really liked the Double Cheesy Gordita Crunch, and they suddenly started to fill it up with cilantro and sofritas, you'd either stop eating at Taco Bell or wage a war against them until they went back to serving it the way you precieve to be right, and used to love. That's kind of where the so-called Fandom Menace is coming from. They want their Taco Bell to taste like Taco Bell, not vegetarian Chipotle. And for some, it's cause enough to create a huge backlash that takes up way to much of their time. They want the Star Wars they remember. So much so they are sabotaging the new, great taste. In this case, Star Wars 9 isn't even on the menu yet. Like a squadron of TIE Fighters, the Fandom Menace trolls are flying in to torpedo Star Wars 9 and its 'Want to See' rating, since the battle against Captain Marvel has 'seemingly' gone so well. At least in terms of that % rating. They are filling up the comments with stinging words. Despite a similar campaign against The Last Jedi, that movie went onto gross $1.4 billion at the worldwide box office, and is considered a major success by all except those who can't quite get over watching Luke Skywalker sip green milk squeezed fresh from the breasts of a moaning sea cow. These score-manipulating campaigns have become an unfortunate part of movie marketing. And there's not really much the studio can do at this point, except make Star Wars 9 something that does truly satisfy everyone. But that probably won't happen, because it appears that some of these so-called Star Wars fans waving their anti-Lucasfilm flags in the air are simply having too much fun taking the franchise down. Case in point, they are trying to cripple Star Wars 9, and they have zero idea what it will even be at this point, aside from seeing a handful of set photos on the Internet. Rotten Tomatoes has been proactive in scrubbing some of the negative reviews from their comment pages for Captain Marvel when it comes to some of the more offensive ones. But the damage has already been done to that movie's 'Want to See' score, which will not likely rise back up before release. The early reactions from critics have been mostly positive. So the good reviews coming tomorrow could help turn the tide. While Rotten Tomatoes can take down some of the negative comments, they aren't into pulling everyone's free speech off the platform, or defeating the pregame warm up with a removal of the comment section for unopened movies altogether. Some fans are going to spend their free time taking down Marvel and Star Wars movie scores no matter the cost. And that's pretty much all there is to it. If you enjoy the movies, you shouldn't be bothered by what a bunch of angry trolls have to say, anyway. Ever seen a screaming three year old who's allowed to continue their tantrum in K-Mart without any interference from the parent and thought, 'I wonder what that kid will be like when they grow up?' Well, here you go. If you want to make your voice heard over the wail of that blue light special, you can go do so at Rotten Tomatoes.